WaSiM is available in two basic versions: The originally developed version (WaSiM version I) uses algorithms based on the concept of variable saturation areas of the conceptual model TOPMODEL for the simulation of soil water flows. The extended version of the model (WaSiM version II), however, replaces the conceptual Topmodel approach with the process-oriented Richards approach, which calculates the water transport in the soil based on hydraulic head gradients and detailed soil physical properties (pF-curve, k (u) function). SInce 1998, the Richards model version of WaSiM is the main branch of the model development. Some major extensions (e.g. the internal groundwater model, surface routing, silting-up and heat transfer) are available for the Richards model version only, which now offers a wider range of application possibilities than the Topmodel model release. However, most newer extensions are available in both model versions (e.g. dynamic phenology, new interpolation methods etc.). Subsequently, the modular structure of WaSiM is shown. There are outlined both the model components and the simulated vertical and lateral water fluxes. 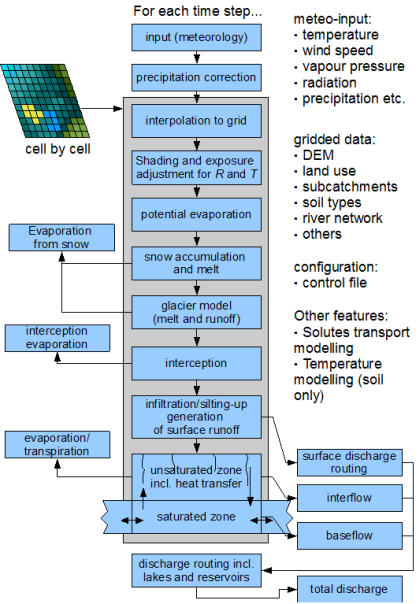 The modules in the gray shaded area calculate the water flow in each grid cell, whereas processes such as runoff concentration are performed on the basis of sub-areas. An important model component is the module for spatial interpolation of meteorological data, which allows interpolations with different interpolation methods. In addition, WaSiM also provides tools to account for the effects of slope gradient and orientation (exposure) on shading and direct radiation and temperature. The processes of snow accumulation and snow melt can be modeled with two temperature(-wind)-index methods or with simple energy balance methods. The impact of glaciers on water balance and flow regime is modelled by a separate sub-model. Evapotranspiration is simulated preferably after Penman-Monteith but can also alternatively be calculated with less data-intensive methods, such as the approaches of Wendling, Hamon or Haude. The infiltration of water into the soil is described by the approach of Green & Ampt, extended by Peschke by a two-stage model. However, this infiltration model is used in the Topmodel WaSiM version only. In WaSiM (Richards) the vertical soil water fluxes are computed based on the Richards equation. For channel runoff routing WaSiM uses a kinematic wave approach combined with a retention approach. When running WaSiM, not all modules have to be activated. Instead, the user can choose, depending on the objective of the application and on data availability, which modules should be used. A control file defines the model configuration to use. This control file is the place where almost all the parameters are set, structures are defined and options are choosen.